Promises to be an interesting series. I've wanted to look into Drools a couple of times, but never got to it. This was probably because it seemed to have a pretty steep learning curve and had too many bits and pieces. 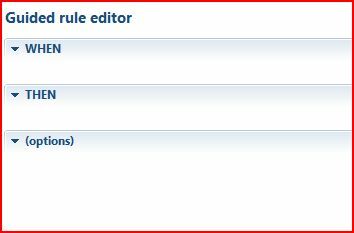 How will you handle migration from Quickrules, is there support for importing from other rules engines? By the way I thought I'd just let you know, it doesn't look like your code snippets are showing up in the RSS feed. I can see the code in the XML but when rendered in HTML it's blank. There isn't any I have seen, all the quickrules rule info is in a DB... will have to write a custom conversion kit. Yeah, I know SyntaxHighlighter java script doesn't work in RSS, you know of something else I can use that will? (besides images). Aye, migration from QuickRules will be painful. There are no standard structures for rule formats currently (JSR94 looks at execution as opposed to format - well at least the last time I looked at it). But Brian is volunteering to look at some kind of conversion tool. I reckon we will end up migration rulesets across and doing a bit of rules refactoring at the same time. Note that eval() is not indexed, so if isBooleanValue() is constant or only changed using a modify statement then you should test its value inside a conditional expression instead. Thanks, yeah I figured as much... this was also just to show another variable creation... but will keep it in mind. Think of your "when" stuff as where clauses in a select statement. You'll find if you start thinking like this you'll start building more Drools-friendly rule constructs. I hope this helps. Thanks for the comment Laird... that is actually a very nice way to think about it. Hi, i like your drools-blog :) Will there be a part 3 with jBPM or other? What is your conclusion. Can Drools replace Yasu-Quickrules? How do you implement base rules in Drools? very knowledgeable post.! Good to learn . It would be helpful for me if you could please provide example of : how to use Excel Spread sheet with drools, like dynamic calculations depending on the requirement..? ?